The colour scheme is intended to aid visibility and incorporates calibration markings. 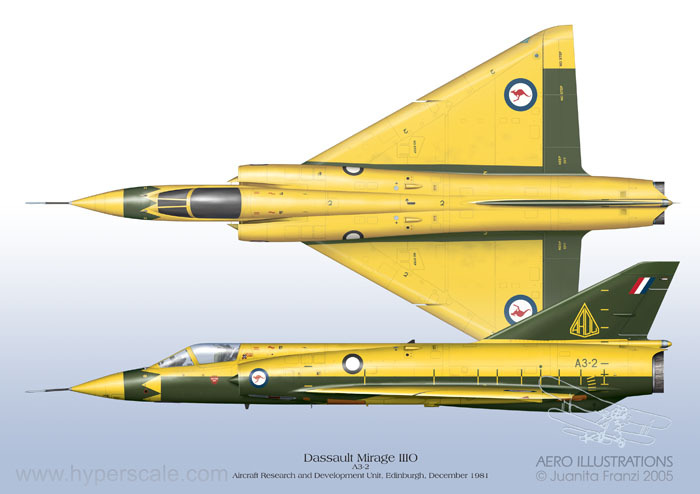 This was one of nineteen 4-view profile drawings of RAAF Mirages completed for the recent Mushroom publication “Mirage IIIO, Colours & Markings” by Darren Mottram and Paul Mason. Included in the book are also an exceptional number of photos collected by the authors over the years. During the preparation of these artworks, Darren and Paul generously made all their reference material and photos available to me. This gave me the opportunity to incorporate a high level of detail and accuracy in the drawings. Art prints of these and the other profiles drawings are available from the artist.